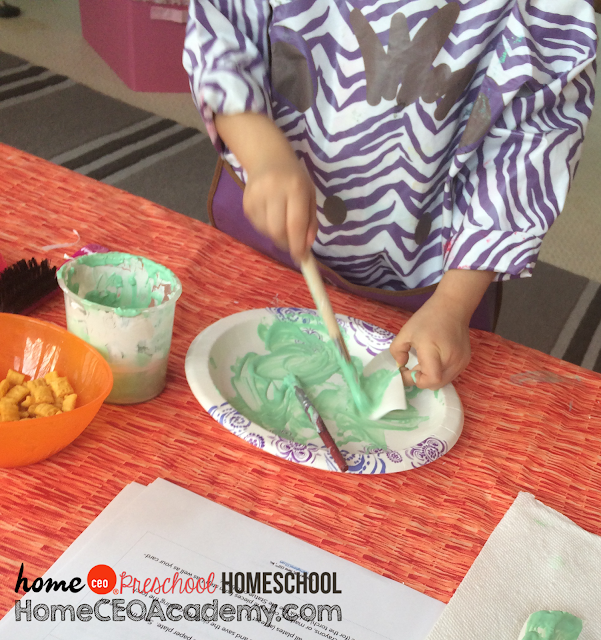 In our homeschool preschool we are doing a 30-week age 4 preschool homeschool curriculum that is so fun! Our first week, on the USA (which is perfect do do in July as part of your Fourth of July activities) is an exploration of our world. 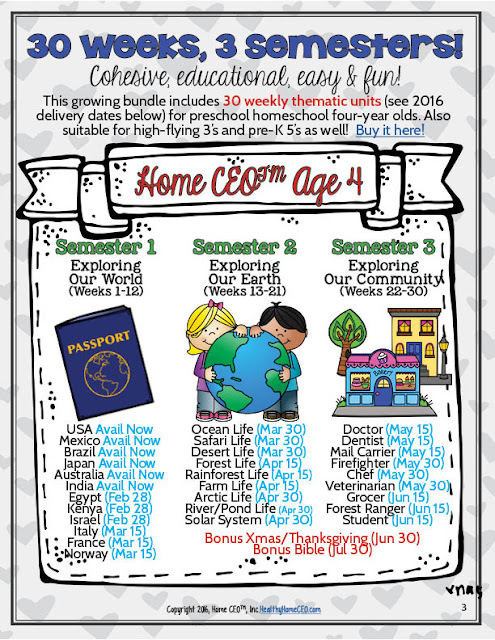 To learn more about our 30-Week Age 4 Curriculum program, and get this USA unit FREE, click here! 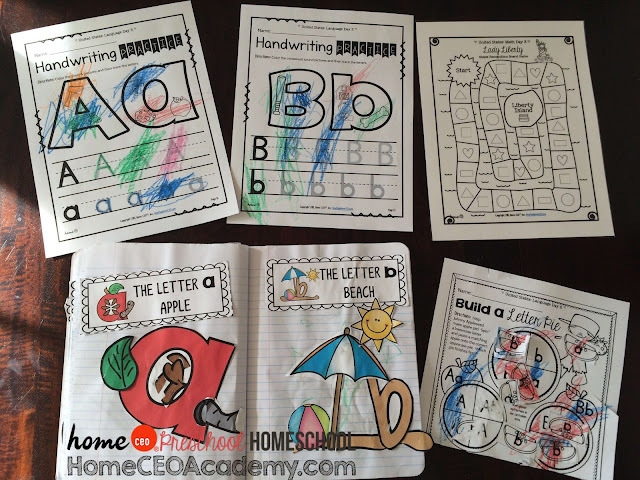 This is our Age 4 curriculum program. 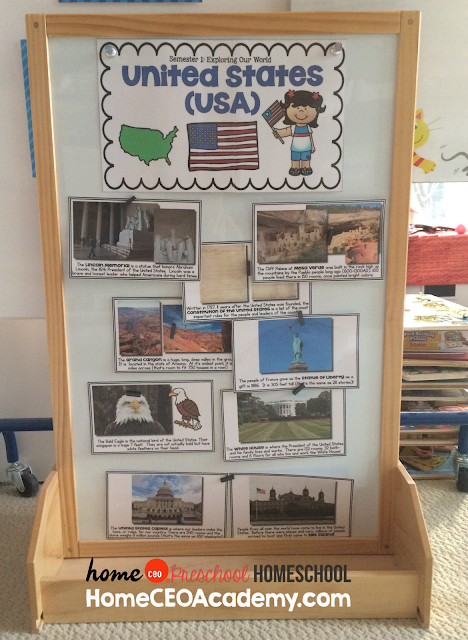 This is our theme board for our USA Week. I can either print it out in black and white or in color. 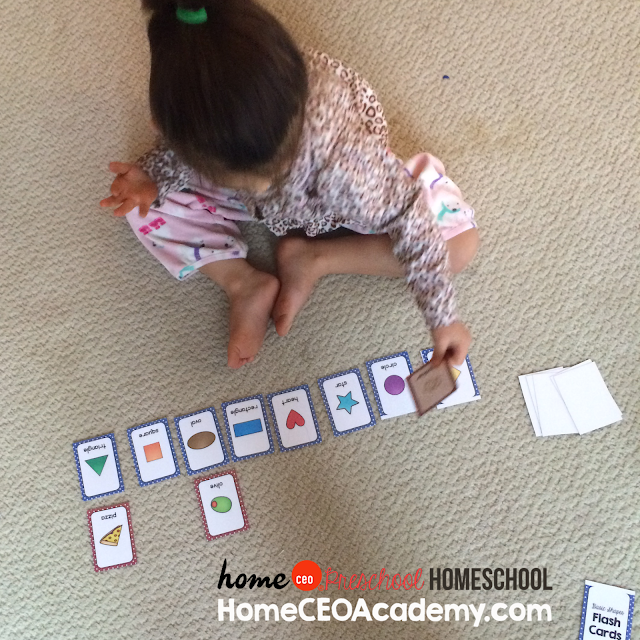 Lexi adds three of our USA themed vocab cards to it for every day of our homeschool preschool (three days a week). 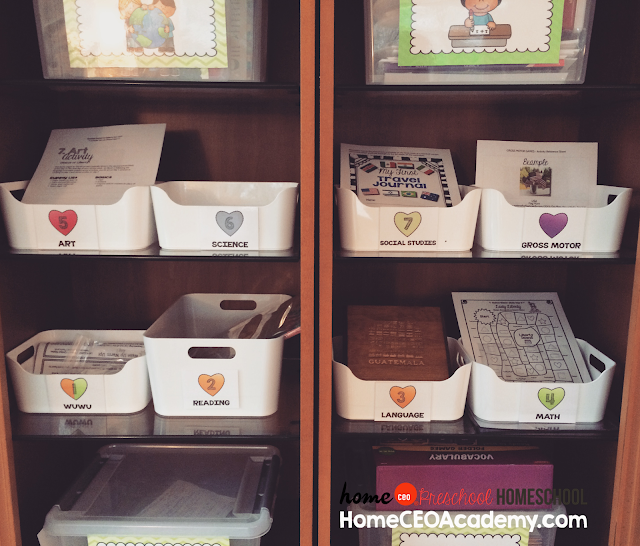 Here are our weekly learning center bins updated for the USA unit. I keep these a little off the ground so that we pull them out and use them together in an orderly fashion when we're ready. Our book selections for the week included Seed by Seed, a Johnny Appleseed book that had a nice moral message that you will love. All the Way to America tells the story of the author's great-grandfather's journey from Italy to the United States and was a great introduction to the concept of who we are as a nation (the big melting pot). 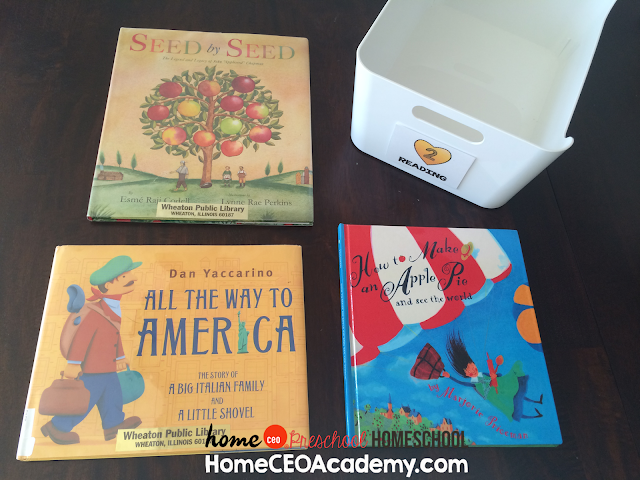 The first two books were library finds but we couldn't help buying "How to Make an Apple Pie and See the World" to add it to our homeschool preschool library. 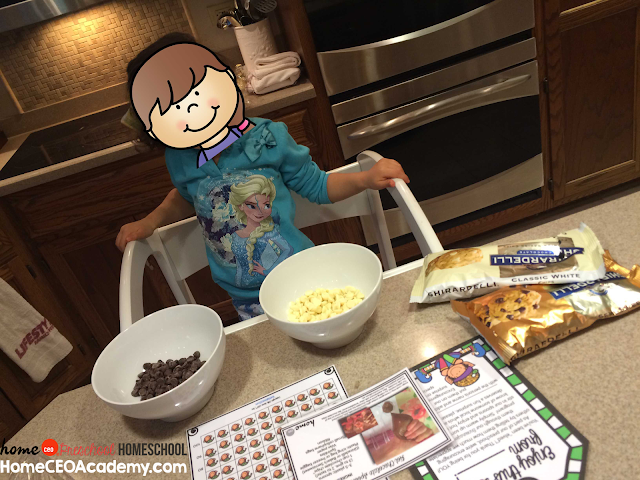 It creatively takes children on a world tour gathering all the ingredients for an apple pie. 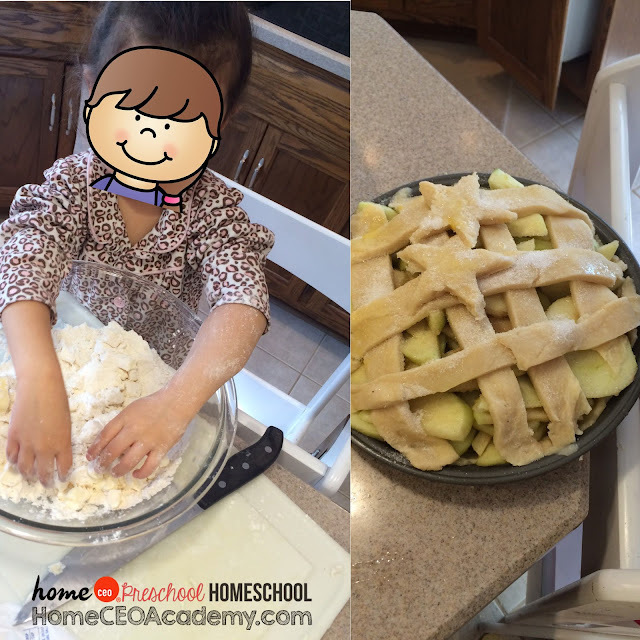 After reading "How to Make and Apple Pie and See the World", we made the apple pie recipe in the back of the book. We were really pleased with how it turned out! It wasn't so intimidating after all. 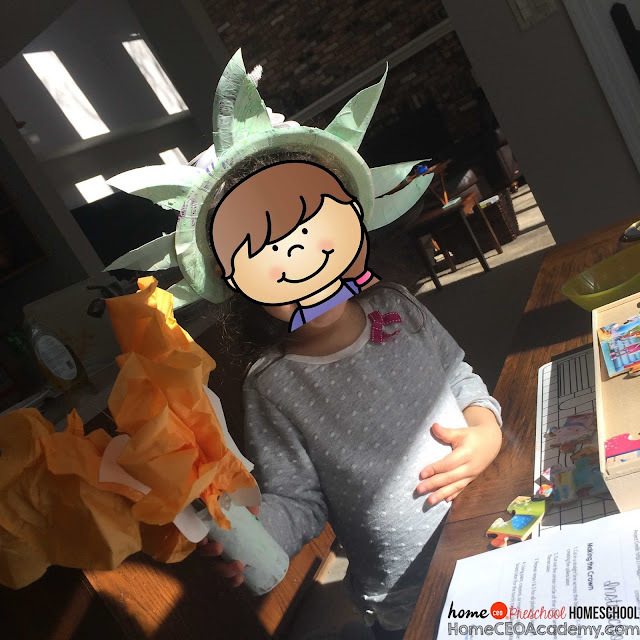 For our weekly arts and crafts project, we made a Statue of Liberty crown and torch. Our math activities included our service learning "Encouragement Elves" program. We made and packaged five chocolate spoons which Lexi then gave to a neighbor to put a smile on their face. Later we tallied the number of spoons that were made. Once a month we do this and the tally card is cumulative so by the end of the year we'll have distributed 10 small gifts and at the same time helped our children learn the joy of giving! 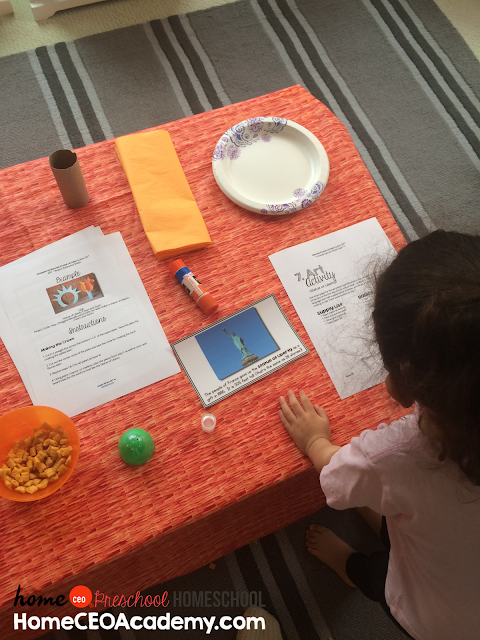 These are some various activities for the language component. We focused on A and B phonics this week. 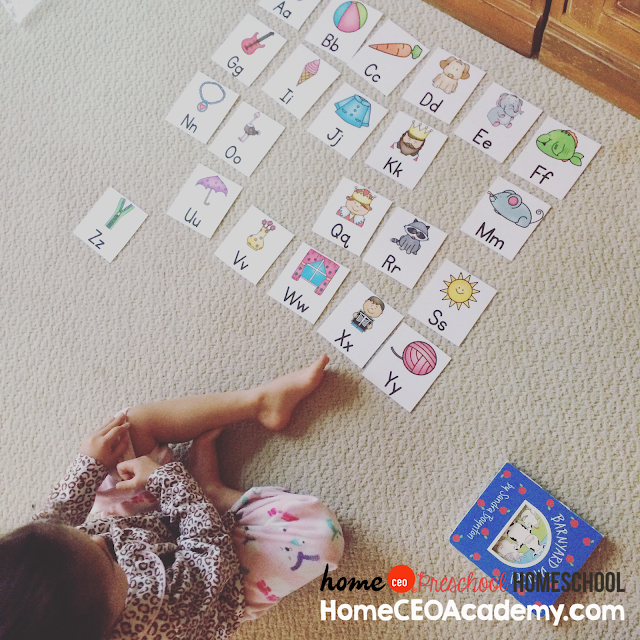 In our daily Wake Up Warm Up, on one of the three days of our WUWU, we practiced the alphabet sequence by finding the missing letters. In our math Wake Up Warm Ups, we matched shapes to "shapes in the world". There were several other activities not shown. We had a great time! 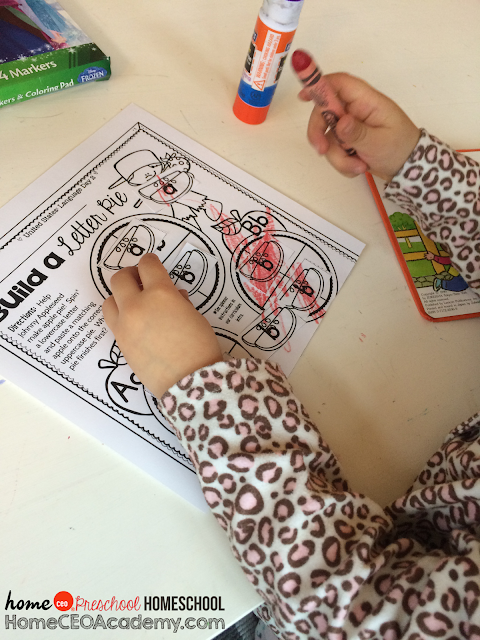 To learn more about our 30-Week Age 4 Curriculum program, and get this unit FREE, click here!